Staying several days or just stopping over? 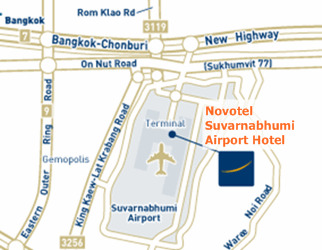 To not miss out on what your destination has to offer, Novotel Suvarnabhumi Airport hotel Bangkok Thailand offers comfortable 10 min walk within the Suvarnabhumi International Airport area. With a 24 hr Suvarnabhumi airport shuttle every 10 min from airport Gate 4 Level 2 and parking available, there is no better place to stay. The Novotel Suvarnabhumi Airport hotel Bangkok Thailand features 5 boardrooms, a pillarless grand ballroom for up to 1,000 people, plus 6 meeting and function rooms and a business centre. 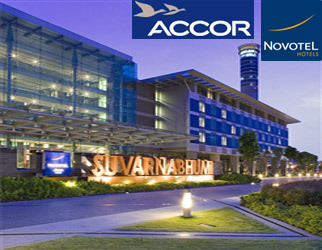 Boasting 612 comfortable and contemporary rooms, the Novotel Suvarnabhumi hotel also offers 2 bars and 4 restaurants. All our network hotels can organize meetings for up to 50 persons, while our convention center hotels can plan and host very large events.